Pivot Works’ Shock Rebuild Kit is one of the only all-inclusive rebuild kits on the market to bring your rear suspension back from the dead with more plush than ever. These kits include a bladder, piston ring, a complete seal head, piston o-rings, a fresh bumper, and a new shaft nut so you don’t have to source individual parts. Every part is up to OEM spec and sized for your bike, so once you have everything reassembled you’ll have suspension that feels like new. If you need help, watch our shock rebuild video for the step by step process. Has a polyurethane bumper instead of the soft rubber. The bumper was too hard and was inferior to the OEM so i threw the Pivot Works one away. Pivot came with a European wing style nut not the original style making it difficult/ impossible to stamp the nut. Piston band looked OEM quality but stretched too much when putting it on; however, this may have been my fault because I didnt have the specialty piston band tool that was none existent in the US - ended up going with a MX tech low friction unit. The retainer disk (or whatever it's called) appeared quality, as was the bladder; they were the only things I could use in this kit. This kit also didnt come with the dampening adjuster Orings, so it's incomplete and the only reason my rear rebuild is taking a week. All seals and parts needed for complete shock rebuild. Had a question and customer service was great about helping me. Everything was there except for the other (42.5X2.0) o-ring for the piston. That's really something that shouldn't be overlooked. Great quality parts and relatively easy to install - I used the comprehensive Rocky Mountain ATV shock rebuild video as a guide. The piston ring was difficult to install and the new shaft nut is dissimilar and unusual to the stock one; leading me to simply reuse the stock nut. Overall, a great product with all the parts to get the job done to restore factory plushness and consistent feel. Everything worked great, but the videos were indispensable to get this built correctly. Excellent product. All the bits you need, none that you don't. Far easier to buy kit than individual parts. It is great to be able to get all the quality parts in one package. The shock came up a treat and was sweat to ride. Everything was the right size and fit very well. I recently rebuilt my suspension and I used this kit for my rear shock and it feels amazing. Kit was missing main O-ring on seal unit, Pivot works acknowledged they had quality control issues with the older packaging (not sure why mine was older) and are supposedly sending out a replacement; although overnight would have been nice since I had to wait a week to get the package and now another 5 days to get the missing part. Also the valve "band" seal was not the same as my re-valved seal so I couldn't use it or the two o-rings underneath it. good quality parts, everything you need to do the job. I have good luck with pivot works products. 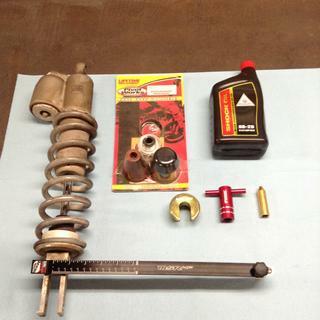 This shock rebuild kit was no different. came with everything I needed to do a full rebuild of my shock. Put about 12 hours on my bike since the rebuilding the shock with this kit, so far it seems alright. Could have used some form of instructions with the kit however. Will this rebuild kit fit on a 2003 ktm 250sx its still the same stile bike? BEST ANSWER: Shock rebuild kits are make and model specific, so provided that you have selected the correct bike and it shows that one is available than yes it will fit. I personally have used the pivot works kit on my yz250. No. there are different size seals. Although when you order check the part numbers for both. The picture may not relate to what you will get for that bike. It has to be bike specific unless you know the suspension is the same model or series as another bike. How do you get the piston ring (bushing) on to the piston. This ring is not split? Thanks Neal. Apply a little bit of oil and it slides on. It’s tight fit so be patient. Is this item suitable for 1998 kx250 ? Michael, thank you for your reply. I checked into this and we do not carry this part for the 1998 KX250. If a machine is not listed on the drop down boxes we most likely are not carrying that item for that machine. I'm sorry for any inconvenience this may cause. Can I get something like this for a cr80? I have looked all over and can't find one anywhere. Or could you do same parts oem? Will this fit a 2009 250 sx stock rear shock? 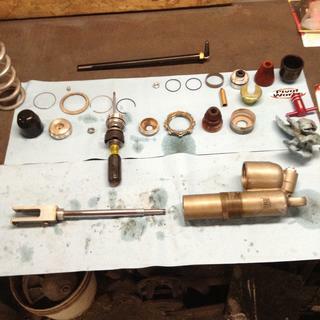 Do you have pivot works/all balls shock rebuild kit for a 1994 rm125? BEST ANSWER: Unfortunately, we do not have this rebuild kit for that machine. I'm sorry for the inconvenience. What kind of rear shock is this for? 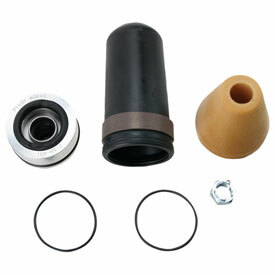 BEST ANSWER: It is for a motorcycle rear shock. What is the application you are looking at it for?